A timeless, classic design - masterfully updated. We are now proud to offer the first ever METALLIC deck of BeeÂ® playing cards. Your favourite cards, fully optimized and transformed into something you have never seen before. 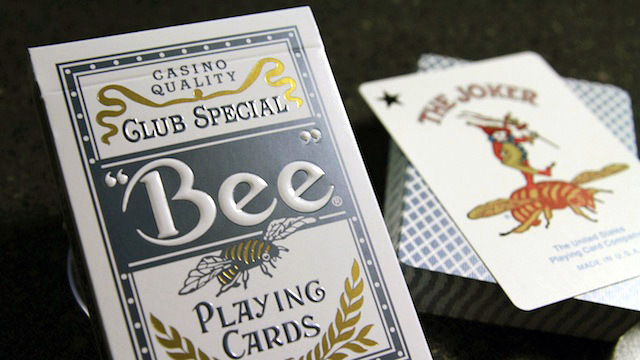 Bee playing cards have been the industry standard for over a century. The most popular deck used in casinos in Las Vegas to Macau, Bee cards are internationally respected as a perfect mix of form and function. The back design, the box, and even the court cards utilize metallic inks that radiate light in a subtle, elegant manner. The box has metallic foil on five sides, showcasing the original Bee Back design that you know and love. Available in two colours - Steel Blue and Crimson Red - the Bee Titanium Edition playing cards were printed at the United States Playing Card Company using the finest quality stock and finish. They feel smooth - not too rigid - right out of the box. The Bee Titanium Edition is simple, with a timeless design you already love. In stock and available now in limited quantities. Bee Titanium Edition Blue A timeless, classic design - masterfully updated. We are now proud to offer the first ever METALLIC deck of BeeÂ® playing cards.